As the media hype over Khan Al-Ahmar fades away, mainstream narratives have yet to find another sensationalist violation to exploit. It is disheartening to see that the disappearance of the Palestinian village from the headlines also means that the fate of the Bedouin community it houses will be forgotten until the Israeli government reverses its suspension of the demolition order. Khan Al-Ahmar’s much-publicized school, built of tires and clay, will also fade into oblivion with the rest of the village and its inhabitants. On Monday, a Palestinian elementary school in Masafer Yatta was served with a demolition order after an Israeli incursion in which, it was reported, the students and staff were ordered to leave the premises. Earlier this month, Israeli settlers flooded school premises in Azzun Atma, south-east of Qalqilia, with raw sewage. Neither attracted much media (or political) attention. In fact, a Human Rights Watch (HRW) report dated April 2018 stated that 44 Palestinian schools are risking full or partial demolitions. Building permits are routinely refused by the Israeli occupation authorities and schools are demolished without giving Palestinian children any alternative premises in which to continue their education. It is precisely such routine violations that have taken Israel’s oppression of Palestinian education and normalized it within the international community. Khan Al-Ahmar managed to escape such categorization, albeit temporarily. 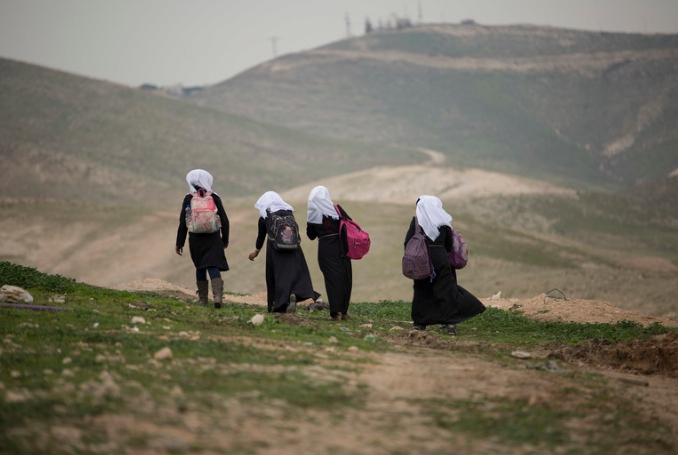 However, Israel’s efforts to obstruct Palestinian education, whether through demolitions, raids or propaganda, indicate the imbalance between political and humanitarian action. For Israel, the targeting of Palestinian education is a political act designed to reduce drastically any chances of Palestinian emancipation, let alone resistance. Palestinians have a long history of utilizing education to provide the foundations for their legitimate anti-colonial struggle. Yet the incessant deprivation is increasingly contributing to a scenario where education is classified as a right from a western, and therefore, acceptable, perspective. Hence, the humanitarian focus on Palestinians being deprived of an uninterrupted right to education is dissociated from the particular needs of Palestinians who are living the realities of Israel’s colonial violence. This mainstream perception should be reversed. The political right to education in Palestinians’ unique circumstances should be recognized, without the impositions of what education means for the hegemony that imposed colonialism on other countries. Education is the basis upon which Palestinian resistance can rebuild itself, the latter being recognized in international law as legitimate for people living under colonial occupation. To accept one premise while relegating the other to oblivion is contradictory. Why should Palestinians have to define their education through restrictive parameters that do not apply to their particular circumstances? The more that Palestinians are deprived of education by Israel while the international community stands by as a nonchalant observer, the more that it is becoming clear that there is an unspoken agreement that seeks to force Palestinians to view themselves as a humanitarian issue and nothing else. Why does the “tire school” in Khan Al-Ahmar attract international attention while other schools are ignored, despite facing similar circumstances? It was the imagination behind its construction which interests the world, rather than the purpose it has been forced to serve by Israel’s ongoing violations. Giving a humanitarian facade to one dwelling enables the international community to create an exclusionary focus point, while other schools and their predicament barely get a look in as a collective concern. Palestinian education must move away from the imposed humanitarian agenda. Be the first to comment on "Palestinian Education Must Move away from the Imposed Humanitarian Agenda #Palestine #GroupPalestine #israelTerrorists #boycottIsrael"